The finest wall map of western Long Island ever made. Robert Pearsall Smith (1827-1899) was a well respected business man and religious leader in 19th century Philadelphia, PA. The son of the head librarian of the Library Company of Philadelphia, John Jay Smith, Robert Pearsall Smith was best known, in his day, for his religious devotion and essays on various aspects of the Quaker faith, especially the Holiness Movement. Pearsall Smith's most prominent work was Holiness Through Faith, published in 1879. In addition to Smith primary business as the manager of a Philadelphia Glass Factory, Pearsall Smith was an active map publisher. Smith's cartographic output, though small was significant and includes some of the first anastatic lithography in the United States. Smith's map publications are also significant in that they sponsored some of the most important and detailed regional surveys of Pennsylvania, New York, Connecticut, and New Jersey ever made. 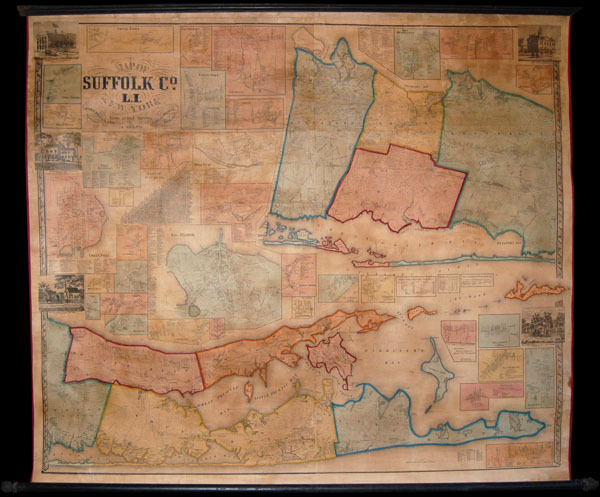 Smith's most notable maps include his wall maps of Philadelphia, PA, Suffolk County, NY, and Westchester County, NY. Smith's detailed cartographic work eventually inspired the regional maps produced by the Beers family later in the 19th century. Very good condition. Full professional restoration. Exhibits overall toning and stabilized cracking. Includes original rollers.